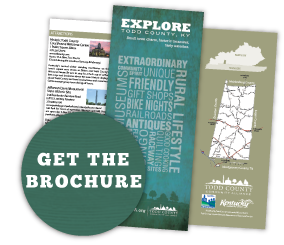 Todd County is home to the oldest Amish settlement in Kentucky. Founded in 1958, the “Guthrie community” is home to “electric” New Order Amish that originate from a now-defunct Amish church at Stuarts Draft, Virginia. Though they dress plain, use the horse-and-buggy, and speak Pennsylvania Dutch, New Order Amish differ somewhat from Old Order Amish in that they tend to have a greater focus on missions and outreach and are generally liberal on technology – such as the use of electricity in homes, and tractors and other modern machinery on their farmsteads. While New Order Amish dot the rural landscape in southern Todd County, a growing settlement of Old Order Mennonites exist in the northwestern portion of the county near Fairview. 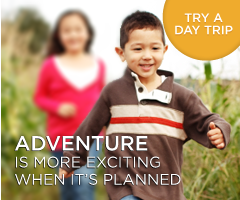 Spend a day in Todd County experiencing the Amish/Mennonite tradition. You will find a humbled and industrious people that produce all types of goods – abundant in both quantity and quality. 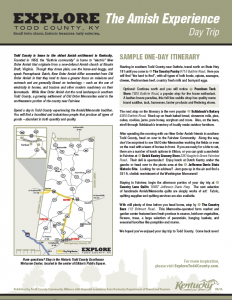 Click the image below or here to download a PDF of the Amish Experience Day Trip.